With four pets running around our home, Christmas has always been one epic game of hide and seek. Not so much seeking the pets—although they do their fair share of hiding, too—but for errant ornaments. Our trio of cats and single hound dog seem to have established a pretty sophisticated system for knocking off the ornaments, and we are constantly tripping over the fallen balls, cleaning up broken glass and plastic. Now, you might not have pets, but chances are good that a lot of you have children, and they could very well have the same M.O. when it comes to Christmas ornaments. 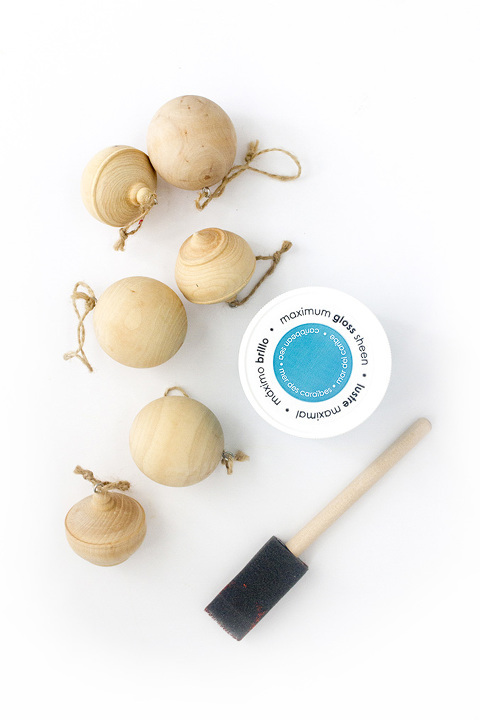 In case you, too, struggle with the annual ornament hunt, here’s a quick and easy project just for you: DIY high gloss Christmas ornaments made from solid wood balls. These heavy duty ornaments don’t bounce when dropped, and are made to withstand the fall without breaking, plus the shiny DecoArt high gloss paint that I tested out gives them the illusion of delicacy thanks to that almost-lacquer-like finish! Read on for the full breakdown. Start by clipping off the pre-knotted string or rope that comes on your ornaments with scissors. Then, shake and stir the jar of paint to evenly distribute the pigment. 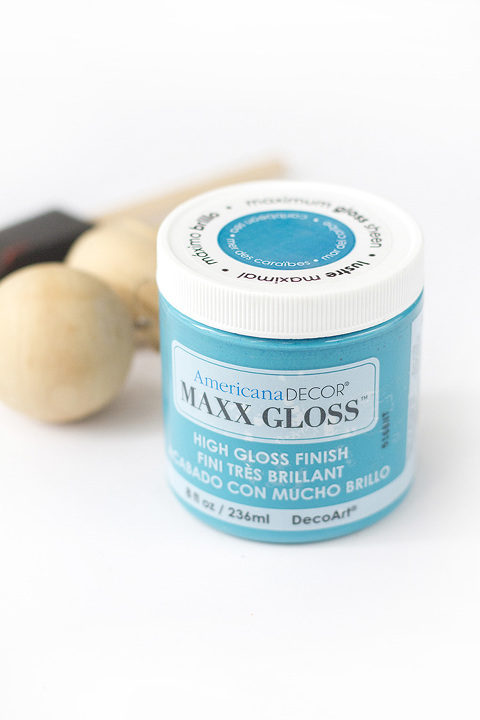 Next, dip your foam paintbrush into the paint and gently run it along the inside edge of the jar on both sides of the brush to remove the excess paint. While holding the ornaments by their metal hooks, carefully coat the surface of the ornament with the paint from your brush. Go into this expecting to get messy, so you may want to wear gloves or have a paper towel nearby for quick cleanup. 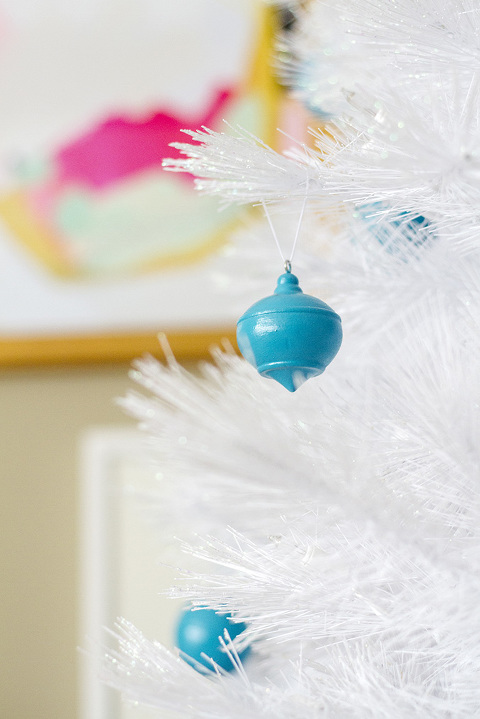 I’ll be sharing my easy solution for minimizing the mess while painting round ornaments (which I only figured out halfway through this project—ugh!) over on the DecoArt blog tomorrow, so keep an eye out for that link here. Since high gloss paint is a little thicker than most paints, you’ll want to allow the paint to dry for one hour between coats—my ornaments needed two coats to get nice and shiny. After the last coat, hang the ornaments on a wire or string line overnight to dry completely. If you got any color on the metal hook during the painting process, you can easily scratch it off the next day with your fingernail. For the finishing touch, cut and tie on pieces of elastic string to match your tree (I used white to complement our new snow white tree! ), and loop the ornaments over the branches of your Christmas tree. The best part, of course, is that these babies shimmer and shine just like the glass or plastic ornaments that you love, but they are virtually indestructible thanks to the solid wood construction. They are perfectly suited to our home full of pets, and to yours if you have young kids (or energetic husbands) running around.